Avoid the pitfalls many Ad Grant managers run into by following these steps. As the Top Contributor over at Google’s Official Ad Grants Help Forum for the past several years, having helped hundreds of nonprofits and answering thousands of questions regarding Ad Grants, there are certain areas that I have seen grantees struggle with. The following list will help you avoid many of the pitfalls that nonprofits and Google Ad Grant managers often run into when setting up and managing a Google Ad Grant account. Going into it, know that best practices for Google AdWords are especially crucial for a Google Ad Grants account. During initial set up, follow the steps exactly as outlined in the Google Ad Grants Account Creation Guide. Set up a basic AdWords account first and then submit that for review (step 3 in the Creation Guide) to the Google Grants team. There is no need to start out with a full AdWords account and this can even cause unneeded issues. You are required to have mission based ads AND mission based keywords. Having ads or keywords that are not mission based can result in suspension of your AdWords grant. Affiliate ads on the website are a BIG no-no. This includes AdSense. Do not try to run paid YouTube ads through your Grant account. It will break. If you run into issues, simply post over in Google’s Official Ad Grants Help Forum – I am the Top Contributor over there and will be glad to help you out. 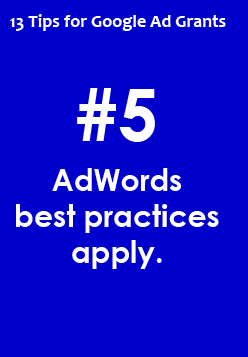 Bonus Tip: If you are not sure what AdWords best practices are, then look to hire a professional to manage the account for you. Working with a professional will not only save you time, but it will also help you get the most out of your AdWords Grant account. By Google’s own admission, the typical Grantee only spends a small portion f their $10,000 per month grant – about $300. In contrast, Kinsey Street client’s utilize over 20x more of their AdWords Grant.